It’s blurry & dark. Mel looks like she’s on meds. I look like I’m surprised someone was taking our picture (even though I was the one holding the camera at arm’s length). And KP isn’t trying to eat the camera, so you can tell she just wasn’t that into it. This post is just to prove that we were there (photoshop can’t fake something like this)! One our way home from Montana, we drove a few extra hours to see this National Treasure. We didn’t really plan things out very well, so we ended up getting there pretty much at dark. We didn’t know they lit the thing up at night, so we were pretty happy to discover that. Except it really was bitter cold out, and hanging around outside in the blustery dark with a baby isn’t that great. Lincoln was clearly the standout of the crowd, although KP said she liked Teddy Roosevelt the best, which is bizarre because what the hell did he ever do except make Teddy Bears or something, right? Well I’m gonna make Reuben Bears and then I’ll be her favorite and someone will have to carve my face up there, too. Take that America! Ok, this is the official 2010 Vacay Recap post. Since I know that nobody really wants to read a long travelogue post complete with photos of all the food we ate along the way, I’m going to try something different. I’m just going to splash a few photos around and provide a little commentary in the form of photo captions. This post is like a Jackson Pollock painting – I’ve just haphazardly thrown stuff out there, and if you don’t like it, it’s because you’re not smart enough. We stayed in a sleepy little town called Mürren that you can only access via Cable Car. The Swiss Alps are huge. Shilthorn: The Swiss are not afraid to build restaurants right on top of mountain peaks. Löwendenkmal: Apparently, seeing the sleeping lion monument is, like, required or something. All your bridge are belong to me!!! Luzern is GREAT for Photobombing! We met up with the in-laws for a week. We went hiking. Zell am See: from our hotel window. I bought this for 85 euros as a souvenir, but lost it when I was pick-pocketed. Zell from across the see. No European Vacay is complete without renting some bikes. We rode the lift up Kitzsteinhorn. We’re TWINSIES!!!! We hiked to the top of Krimml Falls. Krimml Falls is for Lovers. Drove the Grossglockner – the highest road in Europe, or something. A view from the castle in Salzburg. We went to a Mozart concert at the castle. Fun. Everyone in this town is totally nuts about Mozart – and they all wear Hawaiian shirts and carry cameras. Lesson Learned: keep Mel well-hydrated. The Danube is for Lovers. Waiting in line for tickets at the Vienna Opera House. We saw Richard Strauss’ Salome, which is the story of John the Baptist’s beheading. It was great. The most memorable part was watching crowds of grown men and women in suits and dresses stampeding down the hallways like cattle to reserve the best seats. It was totally nuts. OK!!! Well that wraps up the 2010 Vacay Recap! Questions? You can ask me via my Ask Me Anything!!! Hey, by the way, did I tell y’all that we’re going on a little vacay? It’s true. So it might be a little quiet around here for a while. I might try to pop in and say hello while we’re on vacation, but prolly not. You’ll just have to wait until we get back to see photos and such. So be ready for a post that says something like “Golly, I’m so tired that I don’t feel like writing. Look at this web photo album instead.” And then there will be a link to a picasa album with about a zillion fuzzy pictures that you probably won’t care about. It’s gonna be great. Just you wait. Well, I’m not entirely sure. Vacay planning is one of the wife’s specialties. She’s allowed to plan whatever vacations she wants as long as she takes me with her. It works out well for both of us, but mostly me. Despite my Master’s Degree in Planning, and my day job as a planner, I’m completely lousy at planning things. I’d never go anywhere if Mel didn’t plan stuff for me. “Yea? What’s up?” she said. 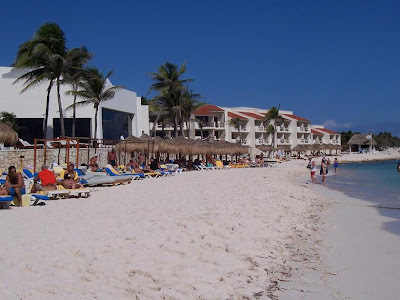 Author Posted on September 29, 2010 Tags vacations5 Comments on Vacay 2010! I was waiting for Reuben to write this post, but since he doesn’t seem to be in too big of a hurry to get to it, I thought I’d give it a shot. This is just going to be a basic travelogue of what we did with a few pictures. If you are just interested in all the pictures we’ll try to have them in Picasa in the next couple days, so stay tuned and we’ll let you know when they’re ready for your viewing pleasure. In the mean time…. We spent our first week of vacation in Copenhagen. We stayed in the same place all week and explored the city as well as did some day trips. The first thing we noticed about the city was all the bikes! You can guess how much Reuben LOVED this. We explored the city on the free Copenhagen City Bikes Here’s the famous Little Mermaid statue. Its actually pretty small, but its in this very cool park. One of the other cool things about going to church was that we met some senior missionaries who offered to let us use their passes for Tivoli, an amusement park in the city. We still had to pay for the rides, but at least our admission was covered. Thanks Elder and Sister Karen! We took a train to the town of Hillerod and saw our favorite castle, Fredericksborg. In front of the castle were some very impressive Baroque gardens- you’ll want to see the pictures of those when we get them posted. Then we took the train to town of Helsingor and saw the Kronborg castle. This is me in the dungeon. If you look closely you can see some an actual prisoner in the background. After a little hiccup with our train tickets, we made our way to Malmo, Sweden. I was excited to see Malmo because its featured on the Trans-Europo train game we like to play. Malmo has a rather disappointing “castle” and this cool building, as well as a neat old town square and a great place for ice cream! Back in the city of Copenhagen is the Rosenborg Castle- home of the crown jewels. Outside the Rosenborg we found one of our favorite places in the city- The Kings Gardens. The lawns were just covered with people- young and old- out enjoying the sun, beer, and friends. You might think it would be pretty rowdy, but it was actually a really mellow, fun atmosphere. We didn’t find too many exciting things to eat, but I must share this amazing treat that we found in bakery down the street from our hotel. We called them salty chocolate balls. They are fabulous! We spent an evening exploring the city center of Amsterdam, which is quite amazing. The next morning we picked up our rental bikes and hit the road. We travelled pretty lightly and all our stuff was in the packs on the back bike racks. For the most part we were on separated bike trails. Our first day we took the scenic route from Amsterdam to Haarlem. After we left Keukenhof, the sun came out and we found more tulip fields! And more windmills! (Sidenote– in case you were wondering, the reason they have so many windmills is because it is WINDY in Holland!) That night we stayed in the cool town of Leiden. I loved all the canals and bridges that ran through the town! The next morning we rode our bikes to the coast/beach. It was pretty chilly so there weren’t too many folks around. We could imagine how popular this place must be in the middle of summer though. Then we took a national bike route down the coast through some amazing terrain. It was a combination of sand dunes/dessert/forest. A very cool place to bike ride. My bike had gears, but Reubens didn’t. For the most part the country was flat enough this wasn’t a problem, but I think this day Reuben was wishing he had some gears. More canals ran through Gouda as well. It was almost like all the houses had their own moats. Very cool! The next day we headed back to Amsterdam. Reuben was the official map master, and he spent a lot of time looking like this: Here I am, happily showing that we did indeed, make it back to Amsterdam. So thats about it. We spent a couple more days soaking in the Amsterdam atmosphere and then started our trip back home. It was an awesome trip and we both feel so blessed that we had this opportunity to do this together. Like I mentioned above, we have tons more pictures to give you a better idea of all the scenery we saw, but we’ll have to let you know when we’re ready to share them- so stay tuned….. Apologies for taking so long to get last weekends adventure posted. I blame USI wireless, our internet service provider. I have found their service to be so unreliable that something as simple as posting to a blog can turn into a real hassle… but enough excuses. On to the adventure! But when we weren’t attending weddings, we took the opportunity to see some of the historic sites around Boston. As it turns out, Boston is a really beautiful city, with a large central park. We came across a small and very old graveyard – full of tourists and elementary school kids on field trips. Of course we had to stop and check it out. It turns out that Paul Revere is buried here and apparently the cool thing to do is to find a small rock and set it on top of his headstone. I don’t really get it, but whatever…. Immediately across the street, we found the Beantown Pub, which has some pretty dang good french fries. Since I am somewhat of an armchair architecture critic – and an actual (as opposed to armchair) urban planner, I had to stop in and see some of the famous neighborhoods – particularly Beacon Hill. I really loved the narrow streets, 3-6 story buildings with hardly any front setback at all – and still room for street trees. It’s completely obvious why it’s so popular (and pricey). We just don’t build neighborhoods like this anymore. Of course, what trip to Beacon Hill would be complete without stopping by at the famous pub Cheers! featured in the awful sitcom of the same name. Here’s a photo of me standing outside the pub, noticeably unhappy and feeling deceived after realizing that, in fact, nobody at Cheers! knew my name. I was also pretty interested in seeing the Big Dig project firsthand, and we ended up waking through it several times, so I got a pretty good look. While I probably would have favored removing the freeway altogether (instead of burying it), I have to admit the new park is pretty nice. So Boston was a really great adventure! 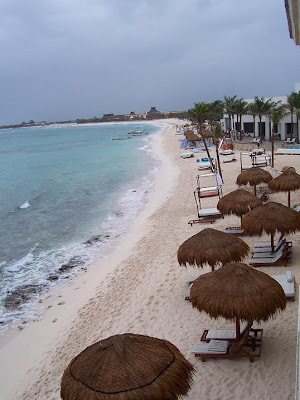 After we were married, Melanie and I spent a week in the Riviera Maya region of Quintana Roo in Mexico. It’s about an hour drive south of Cancun, near the city of Tulum. I thought I’d share a few photos from our vacation and write a little about our experiences. Getting to Mexico was no problem. One of our flights was delayed (or rather, we all boarded a plane, then they told us it was broken, so we all got off and waited for another plane), so we ended up spending longer than we would have liked in the Dallas airport, but no big deal. Here’s a pic of Mel kickin it in the airport. Our first day in Mexico wasn’t as nice as we would have liked. It was stormy and windy, so the beach was vacant, but the resort offered many other ways to amuse ourselves other than the beach, so we were happy. Here’s the empty beach on a cloudy day. 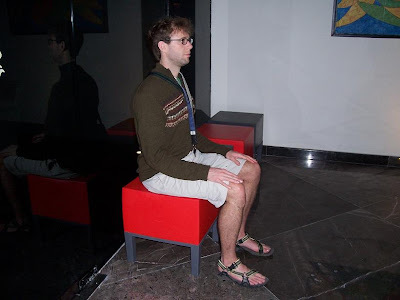 To pass the time until the storm blew over, I decided to sit motionless in the resort lobby as long as possible. Here’s a picture of my resort-record-breaking time of 3 hours and 20 minutes spent sitting motionless in the lobby. Just kidding. I just thought it was a stupid picture of me, so I thought I’d share. By the next day, the storm was gone, so we decided our trip to Mexico wouldn’t be complete without a stop at Chichen-Itza. It was really a neat experience to see all the ruins, especially the giant pyramid. Turns out, Chichen-Itza was voted into the 7 Wonders of the World (so they told me) and you can no longer climb onto or enter into the pyramid or the other structures. We were a little disappointed that we wouldn’t get to climb the pyramid, but it’s ok. Cute little 5 year olds kept trying to sell us souvenirs here, which was pretty hard to resist (especially when they only cost $1), but we left empty-handed. None of the souvenirs really struck our fancy. We also had a chance to eat at a few restaurants other than what was offered at the resort. At one, a bunch of dancers came out and danced in the aisles and would balance stuff on their heads while they danced. It was most impressive to watch them dancing while balancing full beer bottles on their heads. They seemed to do it with such little effort. We checked out some cool natural features along the way, too. There are quite a few of these “giant holes” (that’s a technical term, btw) with water in the bottom. I can’t remember how deep they are, but it’s well over 100 feet. And they said the water was at least that deep as well. In this particular one, they had constructed a staircase into the bottom of it along with a jumping platform. Mel and I both jumped into the water after being warned that the water was “soo sooooo cold.” Well…. maybe it’s cold compared to the ocean, but anyone who has ever been swimming in mountain lakes in Nevada or Utah, it was pretty dang warm. Next, our travels took us to Xel-Ha, a water park of sorts. It’s an ocean bay with warm, shallow water where we went snorkeling, jumped off cliffs, saw dolphins (in a pond, not the bay), swam with fish, “tubed down a river” (paddled across the bay), used a rope swing, walked across a rope bridge, ate ice cream, and various other shenanigans. 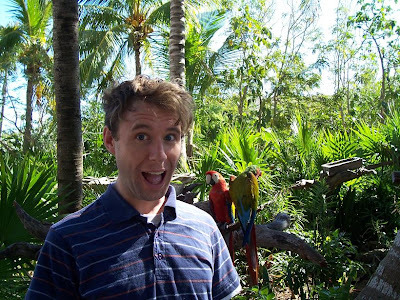 Here’s me with some birds. Finally, we found some bicycles. Who knew Mexico had some sweet single-speeds laying around? It was a welcome discovery. Meanwhile, back at the resort, the skies cleared and the beaches filled, and we got our fill of reading and sleeping on the beach. All in all, it was a great trip, and we had a great time. We did everything we had hoped to do (and more) and had mostly great weather to do it. The resort turned out to be perfect for us (I was a little scared by online reviews of the place I had seen before we left the states, but after purchasing the package), and it met our expectations in every way. We want to go back. YAY MEXICO!